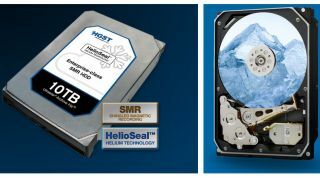 8TB hard disk drives from Seagate have been flooding the consumer market for a few months now, and the company's rivalry with HGST is bound to go up a notch after the latter announced a 10TB hard disk drive, the HA10. The catch is that customers won't be able to buy it; instead, it will only be available to select customers (think Google, Amazon, Facebook or Microsoft) - not only because they are the ones most likely to benefit from the increase in capacity, but also because the new drive is likely to cost a lot more per TB. However, Seagate and HGST are after two different markets. The new drive targets the so-called Active Archive, which HGST identified as the "warmer" tier of cold storage and refers to data being frequently accessed but seldom modified (as opposed to data that is rarely modified or accessed). That scenario is perfect for SMR (Shingles Magnetic Recording) technology which performs better on sequential writes and random reads; this combined with HGST's unique Helium-based technology allowed the manufacturer to cram seven platters in that drive. As expected, even HGST's quoted numbers show that this drive is all about storage and not performance. The company doubled the cache amount on the drive to a whopping 256MB to mitigate the drop in random performance. Check out the reviews of Seagate's 8TB hard disk drive and HGST's 6TB model.